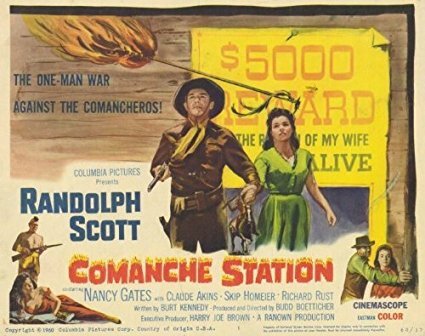 COMANCHE STATION was the final entry in the Randolph Scott/Budd Boetticher/Burt Kennedy series of Westerns, and in many ways a fitting ending. The loneliness of the Westerner is again a key theme as the film begins with the solitary figure of Scott as Jefferson Cody, riding across that rocky, barren, now mighty familiar Lone Pine terrain. He bargains with hostile Comanches for a captive white woman named Nancy Lowe, wife of a wealthy rancher. Stopping at Comanche Station, Cody and Mrs. Lowe encounter three men being chased by the tribe. This entry was posted in Film, Film Review and tagged Budd Boetticher, Burt Kennedy, Claude Akins, Columbia Pictures, Comanche Station, Cracked Rear Viewer, Gary Loggins, Nancy Gates, Randolph Scott, Skip Homeier, Through the Shattered Lens, western. Bookmark the permalink.